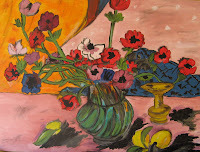 My favorite artist Henri Matisse... the originals are not affordable or available... so I painted them. These are my reproductions of his wonderful work that are displayed throughout my home... 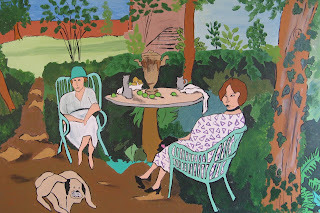 These two ladies reproduced from Matisse's "Tea" 1919 reside in my tiny studio loft within my home... they are always watching over me and I am always wishing I was sitting with them... although I must say I'm not a tea fan... so if they were to invite me over... I would hope they would break out something with a little kick... or bubbles... I've actually thought of adding a couple champagne flutes to the painting! The original painting is on display at the Los Angeles County Museum of Art... yes, I have visited it on many occasions... love it! This reproduction of Matisse's "Anemones in a Vase" 1943 is displayed over a custom built-in craftsman style bookcase in the music room... center stage! I'm not sure where the original painting is housed... if anyone knows... chime in! 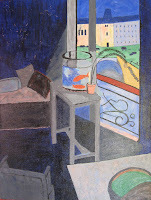 This reproduction of Matisse's "Goldfish" 1911 is resting on an easel in my master bedroom. I viewed the original of this painting and the next painting for the first time at the LACMA "Impressionist to Early Modern Paintings from the USSR"
You are so talented! These are terrific...what a great solution for those of us who love Matisse! Thanks for the nice comment you left on PVE design blog. You are very talented. I love your Matisse reproductions. I was very fortunate to be working at MoMA when they had the "Matisse in Morocco" exhibition, it was so gorgeously vivid, all those oranges and reds and pinks.